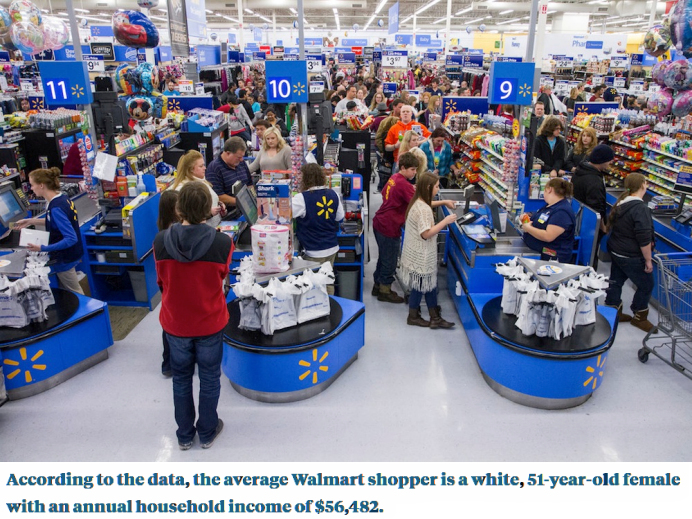 When that above-described average Walmart-shopping 51-year-old female with an annual household income of $56,482 voted for Donald Trump in 2016, she voted to reduce the share of progressive federal income taxes collected from the rich. Having heard Trump's June 28, 2016 speech in Monessen, PA, she apparently planned to pay to help offset the federal government's revenue loss through regressive taxes on consumers like her family. The regressive taxes are tariffs. This post is about such taxes fully understanding that, as noted in the "welcome post" of this blog, we Progressives allowed the 70-year systematic destruction of American Progressivism. As previously noted in these posts, consistent with the goal to create equitable communities within an equitable world, “Progressives” focus on using using a "progressive tax structure" to fund government activities. A progressive tax is a tax that imposes a lower tax rate on low-income earners compared to those with a higher income, making it based on the taxpayer's ability to pay. That means it takes a larger percentage from high-income earners than it does from low-income individuals. More specifically, the Progressive Pacific defines a progressive tax structure as one that, without exception, takes a larger percentage of a person's income from high-income persons than it does from low-income persons in a graduated manner when calculated at increasing income levels. In this context "person" means both "natural persons" and "corporate persons." The tax rate appears to increase as the "taxable amount" increases. But is it really a "progressive tax?" No, because the "taxable amount" is the first $35,000 earned. Earnings above that are not taxed. 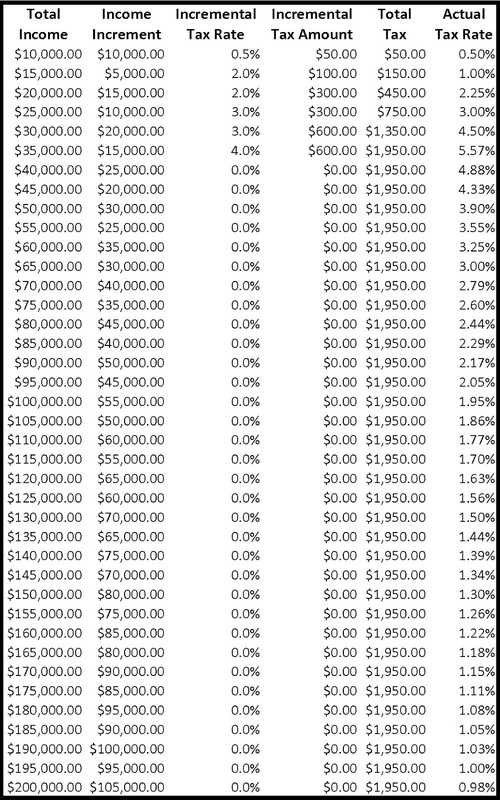 So the actual tax rate on total income paid by the person begins to drop if they make more that $35,000. 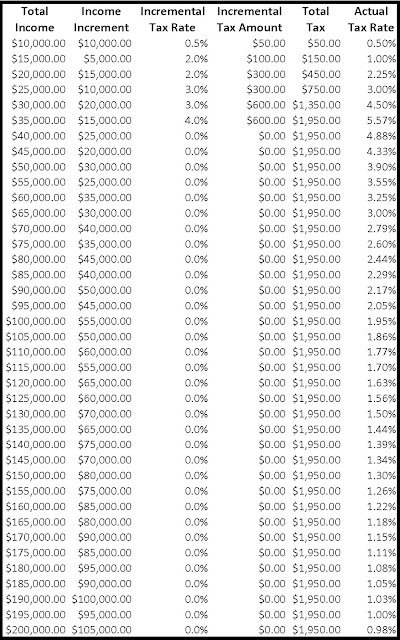 Thus the person making $200,000 is taxed less than 1% of their income while the person who made $35,000 is taxed 5.57% of income. It is a regressive tax structure. Social Security payroll taxes are similar except the rate doesn't increase. It is a flat rate collected on income up to a certain amount. It actually is a regressive tax structure. The federal income tax when combined with the Social Security and Medicare payroll taxes as collected in 2017 from wage earners was progressive in total. When considered together with persons whose income derives from different types of sources such as dividends and capital gains, that progressiveness becomes fuzzy. Again, a progressive tax structure is one that without exception takes a larger percentage of a person's income from high-income persons than it does from low-income persons in a graduated manner when calculated at increasing income levels. One cannot simply assume that because the tax rate increases as the taxable amount increases it must be a progressive tax structure because defining what income is taxable can be manipulated. A "tariff" is a tax on what you buy, not a war against China, Japan, Mexico, Canada, the European Union, and other countries. The use of the word "tariff" is a good way to hide a tax. When a 25% tariff is collected on a product entering the country, that increases the wholesale price by 25%. Importers pay U.S. import tariffs to the federal government and the cost is passed on through the wholesaler and retailer. To borrow some language from the Tax Foundation, tariffs are in a class of taxes "included in the final price of products and services, and are often hidden to consumers." But one doesn't have to take the word of untrustworthy experts on such things or some "fake" news source. It was two years ago this month that Trump started bantering around the phrase "trade war" in a speech in Monessen, Pennsylvania, in 2016. There he threatened Canada, China and Mexico. And it was there that he made it clear he intended to use taxes Americans would pay in order to benefit select American businesses stating: "Our original Constitution did not even have an income tax. Instead, it had tariffs emphasizing taxation of foreign, not domestic, production." The problem with that, of course, is taxes (tariffs) on imports aren't taxes "foreign production", they tax domestic consumption - you the consumer absorbs the tax in the item cost. When a 20% tariff on imported goods is collected at the American port (not in the foreign country), the wholesale price of those goods is increased 20%. 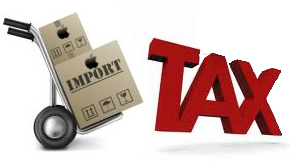 Now, perhaps the cost of Apple products depicted at the right might not be increased the full amount of the tariff as Apple's retail markup is extremely high and the corporation could afford to absorb some of that tariff cost. But consider the hypothetical Walmart receipt depicted at the left above. 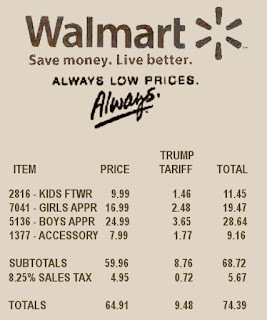 In all likelihood a person buying clothes for their kids which would have cost $64.91 including sales tax, would cost an additional $9.48 because of tariffs which represents about a 15% tax paid to the Trump federal government. And that's also true of stores like Macy's and Costco. 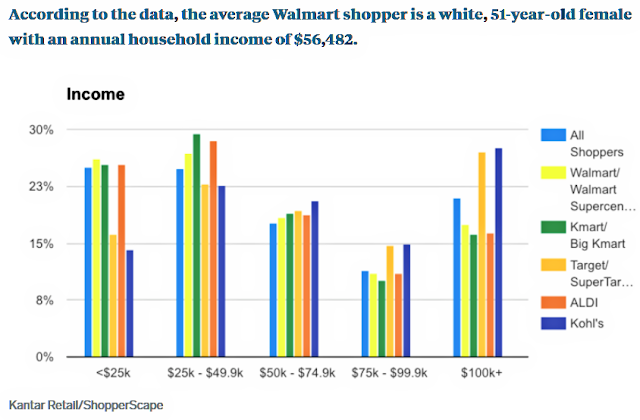 What may be more surprising to home-owning, out-of-touch, older generations is that two thirds of American millennials, or adults between the ages of 20 and 35, shopped at a Walmart store in the last month and are more likely to shop at Walmart than the general population. They need bargains as they spend on diapers, then kids’ clothes, pay off student debt, and/or save money to buy a home. It is certain that the tariffs generated by Donald Trumps actions will do significant harm to the economies of the red states. But they will also cause damage to the economies of the Progressive Pacific States. And it will be worse for those who find themselves in the lowest 80% of earners and/or who's net worth is in the lowest 90%. That is because taxes on goods are regressive taxes - those who earn less pay a higher percentage of their income for those taxes. Consider the Walmart receipt above. It indicates that $9.48 is being paid towards the tariffs. If the customer's monthly income is $9,480 ($113,760 per year, $54.69 per hour), the tax represents 0.1% of the monthly income. If the customer's monthly income is $1,896 ($22,752 per year, $10.94 per hour ), the tax represents 0.5% of the monthly income. Before the tariffs this wasn't a cost for the customer. It is a new cost, a tax increase. And for the low income customer $9.48 may represent two meals for his/her kids. That is simply unacceptable to a Progressive. If you click on the table above it will take you to the source article at the Tax Foundation. As indicated in Table 4 above, they determined that the tariff proposals would produce $145 billion a year in additional tax revenue but would cost 364,786 full-time equivalent jobs in the economy. In a separate study, the Tax Foundation determined that The 2017 Tax Cuts and Jobs Act enacted by the Republicans would reduce federal personal income tax (mostly for the wealthy) and corporate income tax revenue by $1.47 trillion over the next decade, or an average of $147 billion a year, and add an additional 339,000 full-time equivalent jobs in the economy. 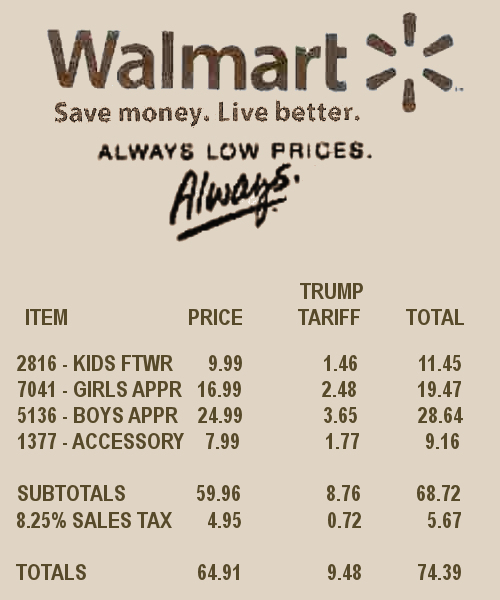 Thus, the net effect of the tax policy described by Trump in the election will be to significantly lower taxes for corporations and the wealthy while offsetting the revenue loss with tariffs mostly passed on to the consumer, particularly impacting the Walmart shopper as indicated in the receipt above. The expected side effect of the implementation of Trump tariffs has been tariffs levied on American exports in response by the other nations that Trump has impacted. Any person who doesn't see the marketplace as a game board would recognize this as competition. But Trump sees marketplace competition as "war." As noted in Wikipedia: "War is a state of armed conflict between states, societies and informal groups, such as insurgents and militias. It is generally characterized by extreme aggression, destruction, and mortality, using regular or irregular military forces." Tariffs are not bombs or bullets reigning down terror, killing people. But the United States is so comfortable with "warfare" that people, particularly those that have never been in war, use warfare metaphors without grimacing. Unfortunately for Donald Trump, the Chinese noted his foolishness. 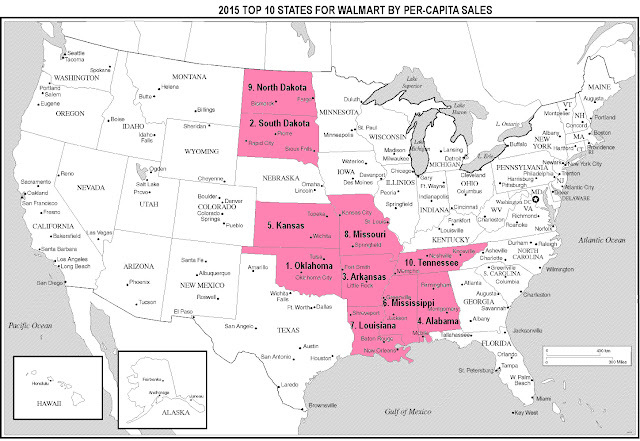 In response to his "trade war" metaphors, they "targeted" their response to tariffs levied on American exports to goods that more drastically impact red states, states that voted for Trump. The Trump administration announced Tuesday it will provide $12 billion in emergency relief to ease the pain of American farmers slammed by President Donald Trump’s escalating trade disputes with China and other countries. The Agriculture Department said it would tap an existing program to provide billions in direct payments to farmers and ranchers hurt by foreign retaliation to Trump’s tariffs. With congressional elections coming soon, the government action underscored administration concern about damage to U.S. farmers from Trump’s trade tariffs and the potential for losing House and Senate seats in the Midwest and elsewhere. I am a farmer and a Trump supporter. I agree that China needs to be punished for stealing patented U.S. technology. But opening a new front in this trade war, while trying to reduce the blowback on farmers with a Great Depression-era transfer program, is not the right approach. It is the economic equivalent of treating a hangnail by cutting off your finger. As Trump’s aid package tacitly admits, tariffs hit farmers especially hard. With farmers already facing economic head winds, including oversupply and drought, I predict that even with this aid, expanded tariffs would be the breaking point that puts some farmers out of business entirely. As the history of the Great Depression demonstrates, such federal and bureaucratic farm-support programs rarely compensate for the full burden of a trade war, while usually ushering in unintended consequences that distort the farm economy. Farmers use a lot of steel, which Trump subjected to a 25 percent tariff in March. Combines, grain bins, fencing and cattle gating, which we are constantly upgrading and replacing, have become significantly more expensive as steel prices have jumped markedly because of the tariffs. This has taken a painful bite out of our already-slim profit margins. Yet the most significant consequence of tariffs for farmers has been the inevitable tariff retaliation from trading partners, which reduces our export opportunities. For instance, China has targeted soybeans and hogs with steep retaliatory tariffs. These farm products are popular in China and fixtures on Midwest farms. More than one-third of U.S. soybeans, the second-biggest crop in the nation, goes to China — about $12.4 billion worth. Since May, soybean prices have dipped about $2 per bushel to about $8.50 as export markets have dried up. For every dollar lower a bushel, farmers lose about 10 percent of their revenue. Meanwhile, pork exports to China are down nearly 20 percent this year. China is an especially valuable market for pork farmers because it purchases the lower-value portions of the hogs, such as the tongue and ears, that are difficult to sell elsewhere. As a result of the limited export markets, meat is piling up in U.S. cold-storage warehouses. Since May, prices of lean hog futures have fallen by 14 percent. The Bruces are part of the fifth generation in a family that holds more than 3,000 acres of farmland near Stockton, where they've owned land since before the Civil War, according to Kalena. Kalena has been an active figure advocating for rural life and conservative policies. She and her husband continue to support Trump despite anticipating a short-term squeeze. She is a conservative obviously enchanted with the idea of her ties to land that date back to the time when slavery was widespread and the area had just been ceded by the Osage Indians. She has a focused professional education and voted for Donald Trump. One has to wonder if her view includes something more than their wealth derived from their family being hard working European-Americans. In 2015 the LA Times ran an Infographic piece West Coast ports: What comes in, what goes out and what it's worth providing look at the volume and variety of both imports and exports at the 28 ports along the West Coast totaling over $630 billion in 2014, including smaller ones like Kalama, Washington (total 2014 trade $3.0 billion, top export Soybeans, top import Rolled iron and steel). We cannot continue to allow the population East of the Transcontinental Divide to interfere in Pacific Rim trade economics.